NEWPORT -- Duane Cronin seems to have a knack for resurrecting houses from the ashes. His own home, a 1990 Newport ranch that he renovated , sits on a lot where an older row house once burned down. Now his company, Diversified Capital Management, is finishing work on another historic Newport row house with a fiery history. Built in 1900, the 2,800-square-foot house on Maple Avenue was damaged by fire in 2013, and the bank later foreclosed on it. Cronin bought the house from the bank in 2017, not long after he moved to the area. It had also been chopped up into apartments at some point in its history. Cronin said it had at least five entrances when he bought it. After more than a year of work, the house is once again a single-family home. With four bedrooms and four bathrooms, it has both historic details and modern conveniences -- just the way Cronin likes it. "I won't go new if I can save character," he said. "But I like to add a modern flair that makes it really livable." Others appreciate his style as well: The Maple Avenue renovation earned him a 2018 River Cities Excellence in Preservation Award. Getting to that point involved dealing with the fire damage, which included rebuilding the third level's floor and most of the second-floor balcony, including its arches. "I thought those were a defining feature of the house," he said of the latter. The work went far beyond fixing that damage. Cronin refurbished all the windows and stained glass on the first floor, added molding in the style of the time period, exposed brick that was under plaster and removed drop ceilings. 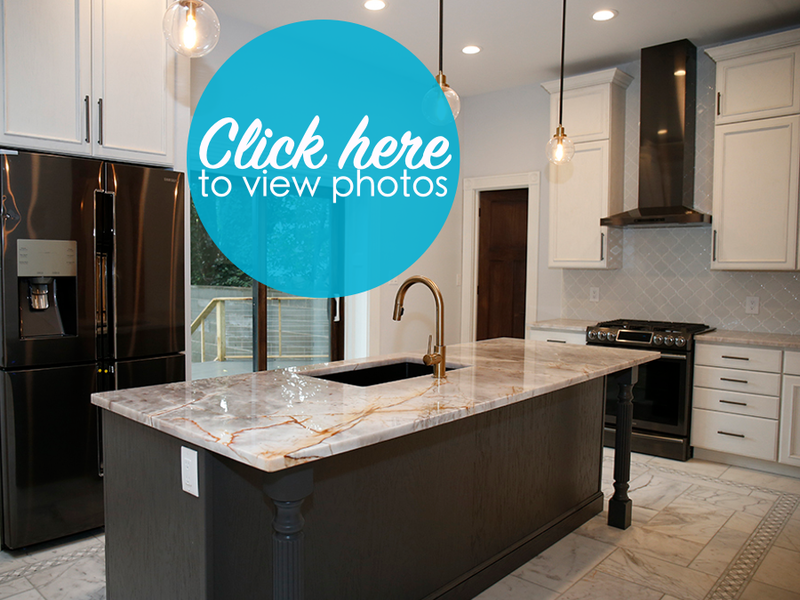 The home's new, bright kitchen has skylights and marble tile, plus a quartzite island with a bonus sink. A former back stairwell adjacent to the kitchen became a pantry. The kitchen walks out to the small backyard that includes a garage. Upstairs, the master bedroom connects to the second-floor balcony. It also boasts an old mantel Cronin had in his 7,000-square-foot Newport warehouse, which he bought complete with its contents. Some of the items are things he can use in his renovation work, like 50-some doors and 17 fireplace mantels. This particular mantel, which he estimates is around the same age as the house, was covered in white paint, but he had it stripped and stained, and had cracked glass tile added. An iron fireplace screen he found in the house completed the look. Another interesting new feature is the home's third-floor "bonus suite" in what was formerly an unfinished attic. Slanted ceilings that are very low in some areas made it difficult to figure out what to do with the space. Cronin took inspiration from designs he saw in Europe, where the bedroom and bath aren't separated, to fill out the space. While he's been working on the home, Cronin has heard some interesting neighborhood lore about it. For example, he's heard that years ago, a dancer at one of Newport's many "adult" nightclubs once lived there. And she had an unusual housemate. "One of the guys who lives across the street swears she had a mountain lion as part of her act," he said. Although that might sound like a local urban legend, it seems it's at least based in truth. Retired longtime Cincinnati and Northern Kentucky reporter Terry Flynn remembers both the dancer -- her name was Sylvia, he said -- and the big cat being around Newport in the late 1970s. But the cougar was just a pet, he said. "She never used the cat on stage at all," he said. "The only thing she ever used was snakes." Whether or not Sylvia and her mountain lion lived in the Maple Avenue home, any home that has stood for more than a century is bound to have its stories. "These houses are living history, even pieces of art," Cronin said. "That's part of why we try to salvage as much as we can." Cronin has now renovated four homes in Northern Kentucky, but this one, which he plans to sell or lease, stands out. "This is my favorite, without a doubt," he said. It doesn't hurt that it's a beautiful space. As visitors walk through the original front door, the sight of the mostly original banister, original wood floors and exposed brick give the home a real "wow" factor. Even before guests walk through the door, though, there are new features to appreciate. Out front, a formerly sloped grassy patch has been upgraded with plant beds. Cronin chose a dark blue paint for the exterior, which contrasts with the orange hues in the stained-glass windows. "At night, I think it's a bit of a showstopper," he said.